Lawrie said there is a big difference between the monopine presented by AT&T at a public information meeting in late 2014 and the structure as it is now behind the Cornerstone Pub. Town Chair Don Sitte said he had heard from several town residents concerned about the look of the cell tower. “For the record, the town has no jurisdiction over how the tower will look or where it’s going to be placed. It was taken out of our hands by a new law that the governor signed last year,” he said. The Wisconsin cell tower law was actually changed in 2013, and it allows companies to reach agreements to install cell towers with private property owners, with little or no input from local government. She also informed the town that the project is still several months away from completion. A microwave line-of-sight tower operation has been ruled out, meaning the costlier and more labor-intensive option of installing fiber cable will be used to make the tower operational. “While we had hoped for an up-and-running date for the new tower by mid-summer, this is being pushed back until fiber is delivered to the tower, which could take several additional months for completion,” Roberts wrote in her email. 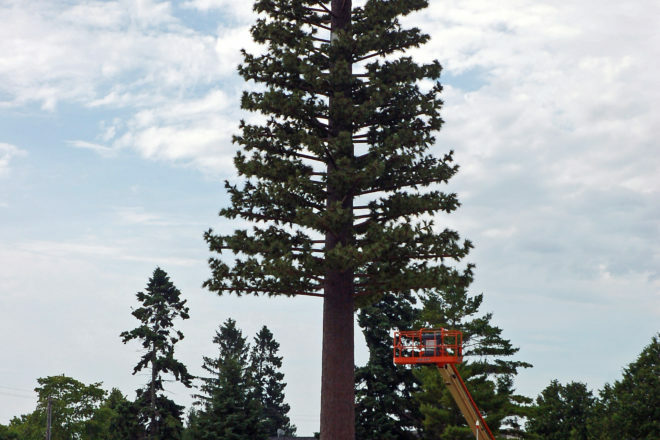 Max Laird, who lives on Guy Street, which overlooks the tower, said he and his neighbors are looking for clarification on how the finished tree will look. “We were told repeatedly by the workers that eventually when it’s all done, the antennas, the ones painted in the last two days, will be gone,” Laird said. “I appreciate that,” Lawrie said. In other news, Brynn Swanson, who has been the coordinator of the Baileys Harbor Community Association (BHCA) for the past 4½ years, announced at the meeting that she had turned in her resignation due to an unnamed incident that took place during the Fourth of July event the association puts on. “I had an unfortunate experience on the Fourth of July and kind of lost my interest in doing this,” she told the board, saying she met with the BHCA board last Thursday and told them of her decision. She said the board decided to split her job into three positions. Swanson will be the part-time marketing coordinator. Another person will be hired to run the visitor center from April to October, and a third person will be hired to serve as event coordinator. The town board also talked about mirroring Jacksonport’s phragmites ordinance after a presentation on phragmites and wild parsnips by Door County Soil and Water Conservationist Krista Lutzke and Brian Forest, land manager at The Ridges Sanctuary. Lutzke mentioned that state and federal grants for invasive species control are getting more competitive. Of four proposals the county went after for this season, it received one half of one proposal. Part of the problem, she said, is that Door County is so far ahead of other weed management areas in the state that it is hard for grant awarders to justify more Door County grants. One thing that helps, she said, is obtaining financial pledges from municipalities and landowners. That sort of investment shows to granting agencies that the entire county, and not a single entity, is the grant recipient. Forest said Ridges is working with the University of Wisconsin-Green Bay to do inventory and control work this fall with a $200,000 aquatic invasive species grant for the Ridges and neighbors along the Baileys Harbor shoreline – from the marina almost to Rieboldt’s Creek, as well as the Ridges’ property on Clark Lake and that entire shoreline. The board also discussed banning dogs from the rec park. While a sign at the park calls for leashed dogs only, several board members said that is often ignored. Sitte suggested town staff research dog ordinances in other municipalities and bring it up for discussion at the August meeting.